April 1968: Benjamin Mays ’20 delivers final eulogy for the Rev. 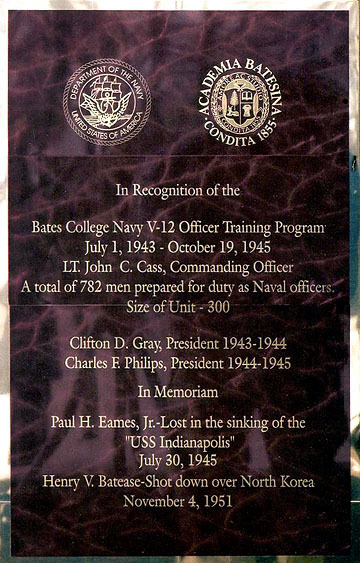 Martin Luther King Jr.
Beginning in July 1943, the Navy’s V-12 program stationed 120,000 student sailors at 131 U.S. colleges, including Bates, for officer training and accelerated college instruction. V-12 was a marriage of convenience. 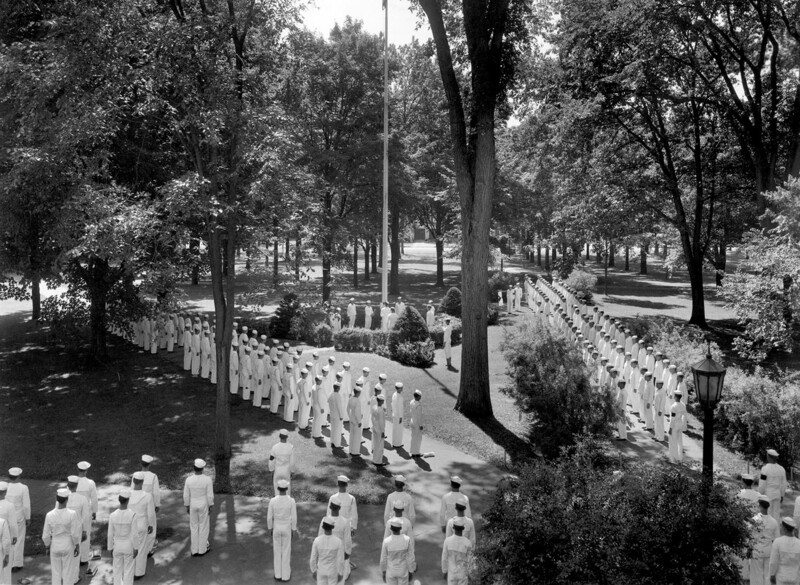 With the World War II draft age at 18, the Navy feared a shortage of college-educated officers. 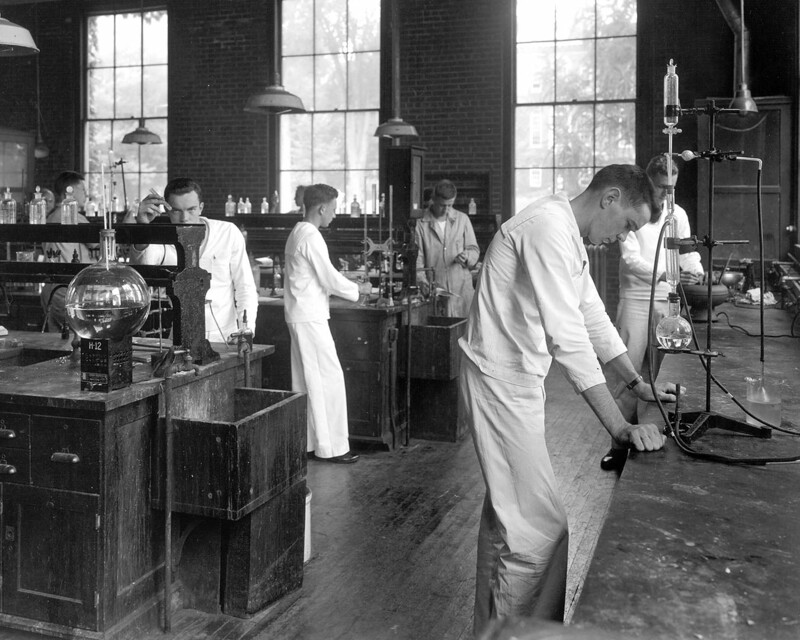 Colleges like Bates, meanwhile, faced dwindling wartime enrollments. From a pre-war high of 749 students in 1940, Bates’ enrollment was in free fall, tumbling to 594 by spring 1943. But then the Navy arrived. By the winter of 1944, enrollment was back to 679, with 283 “apprentice seamen” and 396 civilians (84 men and 312 women) rounding out the student body. The Bates V-12 trainees included enlisted men who’d already seen action in the Pacific, plus high school graduates, like the one who thought a train trip from Rhode Island to Maine was a big deal. Many came from rival colleges like Colby, Bowdoin, or UMaine (in fact, of the first V-12 contingent of 275 sailors in summer 1943, 75 were Polar Bears). Others came from small colleges like Middlebury or Haverford, and from the Ivies. Coming to Bates from Harvard was Bobby Kennedy. Another Bates V-12 sailor was the late U.S. Rep. Leo J. Ryan, killed in Guyana in November 1978 during the Jonestown Massacre. 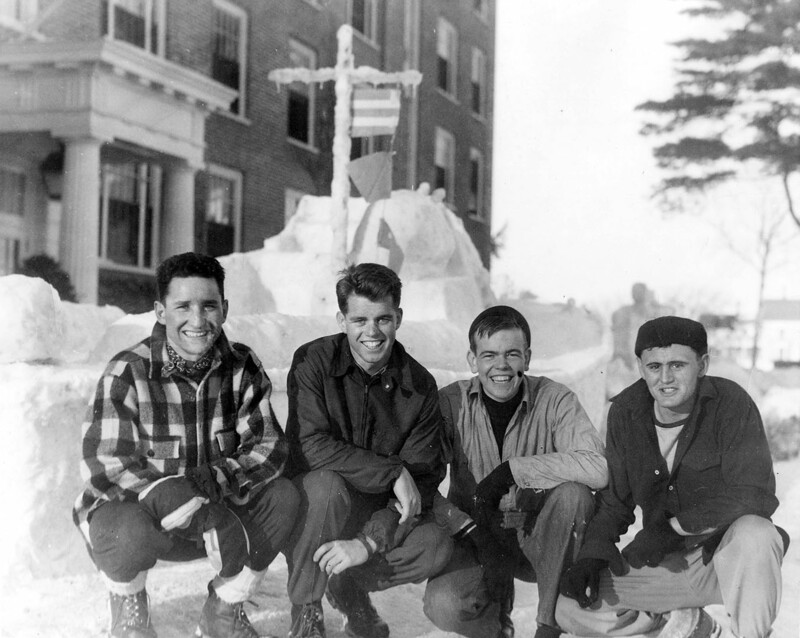 “Democratization” is how Lou Scolnik ’45, a V-12 and Bates alumnus, describes all these men — especially the competitive subset of Polar Bears, White Mules, Black Bears and Bobcats — cohabitating on a coeducational campus. And then there was the issue of nonmilitary male students alongside military men, which created a wary atmosphere. “Like two strange dogs” is how Professor of Biology William Sawyer ’13 once described their getting-along. 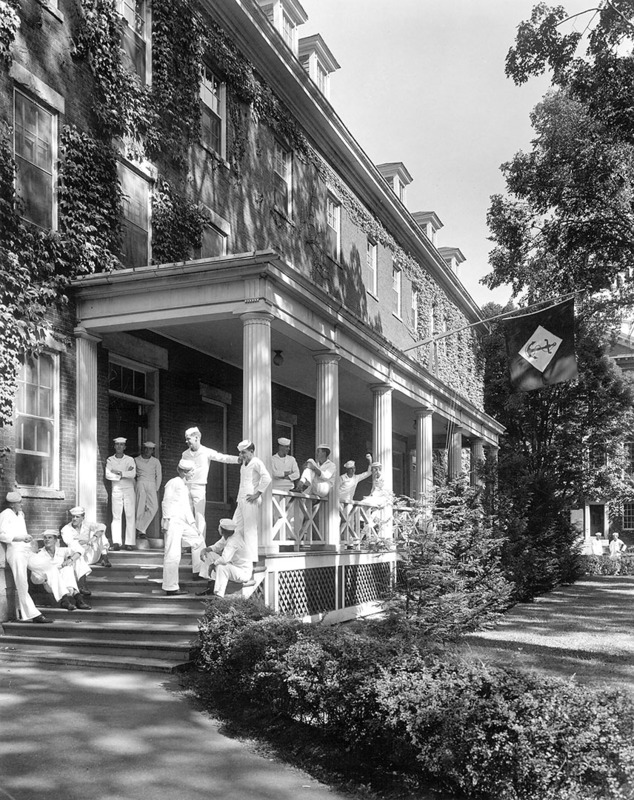 After room inspection and performing morning colors in front of Hathorn, the trainees attended classes with civilians — Scolnick remembers endless labs — until late afternoon. 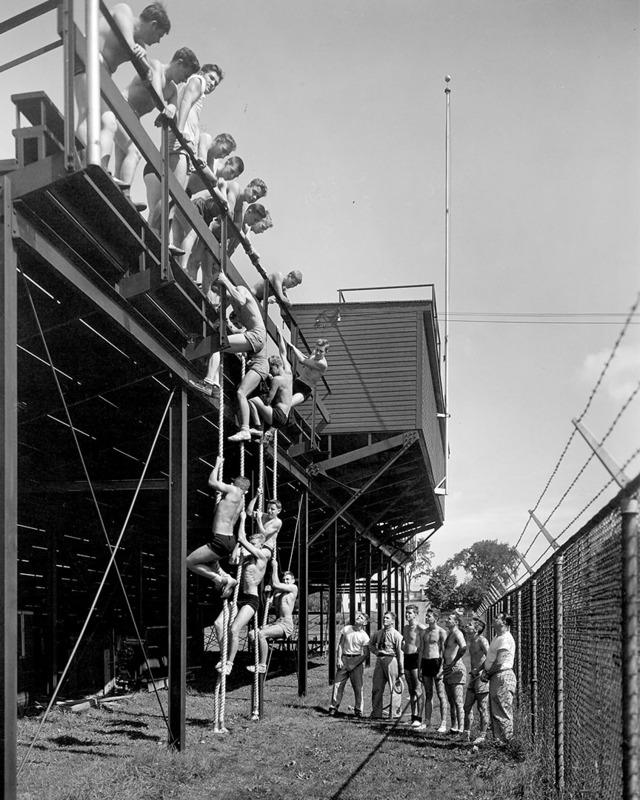 Workouts included rope climbing behind the Garcelon Field grandstand, part of the “Commando” obstacle course. Marching drills might take sailors to the Auburn YMCA swimming pool. Then there were the minor nuisances of military life: “Got another inoculation yesterday and do not feel very well today,” V-12 veteran Dana Smith wrote home to Hollis Center, Maine. Dana Smith, who is quoted in this 2004 story, passed away in 2007. All told, the Bates V-12 program prepared 782 men for duty from July 1943 until the unit disbanded in October 1945. Smith writes an annual newsletter and otherwise serves as the Bates group’s communications officer. For the last two years, the annual V-12 luncheon has been held at the College’s Muskie Archives. Bates’ V-12 materials, along with those donated by Smith, constitute the permanent “U.S. Navy V-12 Collection” at the Muskie Archives and Special Collections Library. A plaque honoring the V-12 unit is on display in the archives. While many of the V-12ers had a disrupted college course (Smith went from Bates to Yale then to UMaine after the war), Scolnik, a Lewiston man, attended Bates before, during, and after his wartime service.